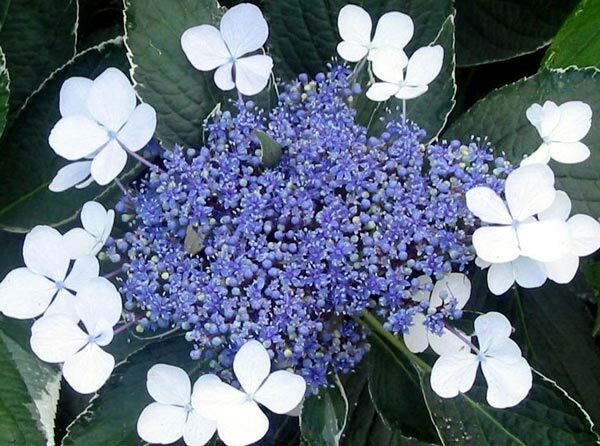 Some gardeners think of hydrangeas as boring shrubs for old ladies, used to fill up the dark side of the house. I was less than committed when I first took some cuttings from the one existing plant here. But they're not boring - and, speaking as a semi-old lady, I now love them! There were no obvious places to grow hydrangeas at Mooseys in the early days, and if my cuttings hadn't been successful I might have forgotten hydrangeas completely. But then the big irrigation was put in for the house gardens. Yippee! I knew that Hydrangeas needed water. One existing shrub was happily thriving by the path outside the laundry. 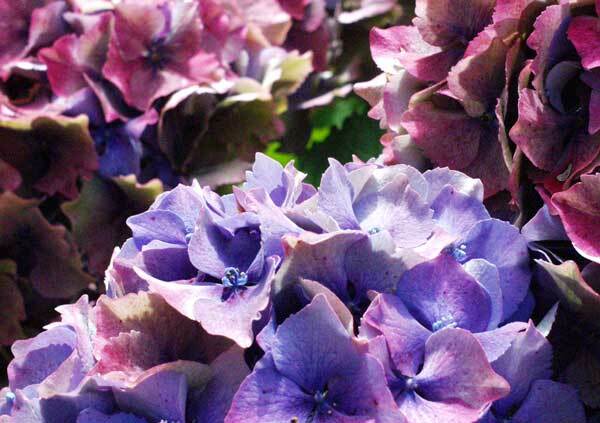 Its blooms would start off blue and then change in autumn to a mottled wine colour. And it's still going strong. It enjoys morning sun only. I don't prune this hydrangea until spring, and pick its flower-heads for dried flower arrangements. Fresh stems in summer just don't seem to last at all. I soon acquired some different varieties. One of my favourites is a blue lacecap hydrangea which lives with some others in the Apple Tree border under the old fruit trees. Also in here is a white shrub with huge flower heads that glow at dusk. There is just enough water for the hydrangeas to be happy, and dappled shade to protect them from the midday sun. Then I found some pot bound specimens of the oak-leaved hydrangea "Quercifolia" at a plant sale, and brought them home. I've planted these in the proposed woodland area over the water race, and am already enjoying the cream flowers and the beautiful leaf form.